The Wailea Sunset Estate may be combined with the adjoining Wailea Sunset Bungalow for a total of as many as 6 bedrooms and 6.5 baths for up to 16 guests. Please read the Guest Testimonials. 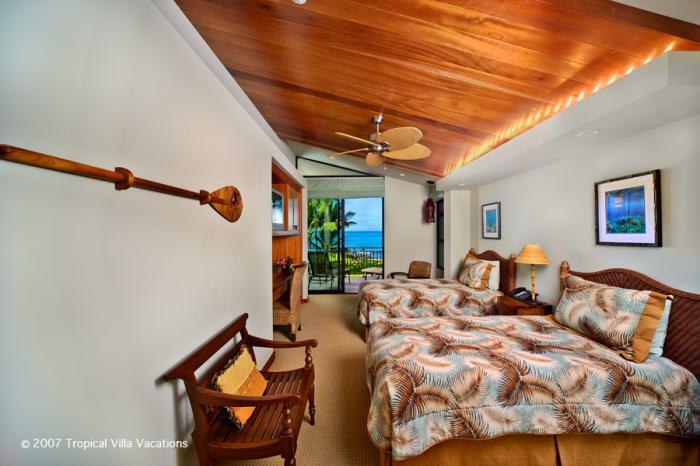 The Wailea Sunset Estate is quite possibly the most successful and the most enjoyable and pleasing vacation residence on Maui. These are all very real guest comments! More than any other vacation home known to us, the Wailea Sunset Estate is a very special abode that is warmly welcoming and comfortable. An extraordinarily high percentage of guests repeat their visit to the Wailea Sunset Estate. Won't you please join us at this beautiful and very fairly priced elegant ocean front estate which is conveniently nestled between Wailea and Makena Resorts on Maui's sunny south shore? The Wailea Sunset Estate is a beautiful 4,000 square foot 3 bedroom 4.5 bath or 4 bedroom 5.5 bath newer luxurious estate home situated nearby two of South Maui's finest sandy swimming beaches and immediately adjacent to Wailea Resort. Just a few of the inclusive complimentary benefits provided are Personal Concierge Service, parking for multiple cars, high speed wireless internet access, local phone calls, mid-week housekeeping service, in-villa safe, fresh floral arrangements, Maui-made exotic tropical bath treats, and personalized in-villa greeting orientation. There is an iPod dock and two XBox game systems provided in the main living area and another in the twin bedroom. We never knew auto racing could be so fun - it's not just for youngsters! For your enjoyment there is both indoor and outdoor dining, outdoor hot & cold shower, washer/dryer, games, an extra outdoor table and chairs for entertaining friends, beach chairs & towels and every possible amenity to provide you with life long memories of a sea-side holiday from heaven! A private chef is available for hire to grocery shop, or to prepare and serve up to 3 meals per day. You may wish to consider the luxury of having a chef-prepared gourmet dinner served in-villa and al-fresco on your arrival evening! Ready to grill complete meals can be delivered, or fully cooked ready-to-eat dining including salads and snacks are additional options. IMPORTANT DISCLOSURE: Sometime in the second half of 2007 or during 2008 it is expected that construction of a new home may commence on a vacant lot which is immediately next door to the Wailea Sunset Estate. Therefore, we are advising customers that construction activity could possibly be visible or audible at any time without advance notice. Our current rates reflect considerable consideration for any possible inconvenience. This is a good opportunity to enjoy a very special one acre ocean and beach front property at a reasonable cost. The construction project could last through 2009.